Ayesha At Last is the tale of a young Muslim woman who aspires to be a poet and must balance what her family expects of her with what she wants for herself. Uzma Jalaluddin is a teacher, parenting columnist and author based in Ontario. 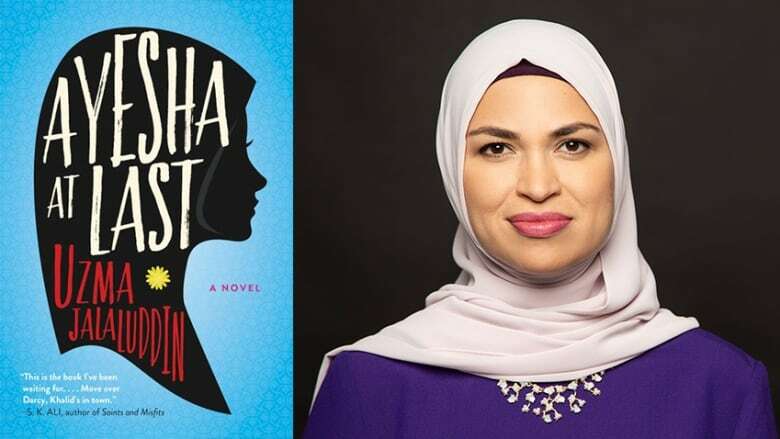 Her debut novel, Ayesha At Last, is the tale of a young Muslim woman who aspires to be a poet and must balance what her family expects of her with what she wants for herself. Things get tricky when she falls for Khalid, a young conservative man who is set to marry someone else. Below, Jalaluddin tells CBC Books how she wrote Ayesha At Last. "I knew I wanted to tell a story that was authentic to my own lived experience. I wanted to write something slightly different than other stories out there about South Asians and Muslims in particular. I read voraciously and widely — I've read and enjoyed so many books by different authors. But especially growing up as a child there weren't a lot of books by diverse writers of colour. I always found books that actually spoke about the immigrant experience and people of colour were filtered through a condescending, sometimes erroneous lens." "This book actually came out of the ruins of another book which was going nowhere. I was out for lunch with a writer friend and she mentioned I could repurpose one of the characters from that book to build a new story. That was the character who ended up being the male lead, Khalid, in this book. "I just had this funny image of this man who is an observant and conservative man in a big beard and wearing religious clothing with a skullcap. He just looks like the stereotypical 'scary person' and yet, he is a total romantic who has fallen completely in love with this girl. I thought it was so funny to look at the juxtaposition of people's expectations of someone who looks and dresses like that versus his romantic heart. He jumped into my head and wouldn't let go. From that character, the rest of the book sort of emerged very slowly, very painfully." "Finding the time to write this book was a challenge. I'm a high school teacher, with all the marking and lesson planning that entails during the school year. When I started writing this in 2010, my children were young and in elementary school. So I would find stolen moments: After school, I would drop them off at piano class or Taekwondo class and head to a coffee shop to write a character sketch or a plot detail for 45 minutes. Or I would, instead of going straight home after work, go to the coffee shop and write like crazy for an hour. During the summer, taking my children to summer camps would be great as I would have some hours here and there to work on the novel. So it was a couple hundred words, here and there, and a book emerged out of many, many drafts." "In the rest of my life I'm not very disciplined. But I've always been a lifelong reader and had this dream of being a writer. One of the biggest things that happened in my life was I had a great opportunity to write a parenting column for the Toronto Star. What that did was give me the discipline of deadlines. I had to write a new 700 word column every two weeks — it had to be edited, polished and ready for publication. I'm an introvert by nature, so I never trusted anyone to share my words with. I started getting feedback for my columns and I realized that I'm actually writing about what it's like to be a Muslim woman living in Toronto. The column isn't about religion at all, but it's still through the lens of being a South Asian Muslim. People seem to respond to it and this helped me grow as a writer." Uzma Jalaluddin's comments have been edited and condensed.